Want a buffet? 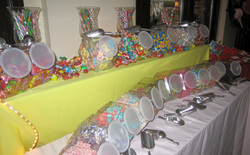 Why not try a candy buffet? We provide a professional service and a beautiful Candy Buffet which will WOW your guests.All you need to do is choose from a massive list of sweets and we will do the rest. We include table decoration,scoops,pick n mix bags,glassware. The Candy Buffet start from £219 and the possibilities are endless. The above themes are just a example of the most popular Candy Buffets please contact use if you require other requirements. We can cater for all sized parties and events.Please just ring us and let us know what you require. We use fresh sweets for you,any sweets left over are yours to keep we do not reuse sweets in any circumstance. The table below is a guide of how the Candy Buffet works.The prices below are for the middlesex area but we can cover other areas just let us know where you are.